When a beloved family friend is diagnosed with cancer, there’s a lot to consider moving forward. How much of it was removed? Was the tumor malignant or benign? What areas of the body is it affecting? And that’s just the start: even after an accurate diagnosis is reached (which can be a lengthy ordeal in and of itself), yet more difficult questions remain when choosing how to deal with it. It’s something that most of us would rather not spend time thinking about: the worst-case scenario. The chances of it happening to our pet is one in a million, right? These are the things that happen to somebody else, not us. But we’re all “somebody else” to somebody else, and the worst-case scenario can and oftentimes will happen, no matter what the odds may theoretically be. So while we may not want to entertain the possibility now, it’s important to discuss what needs to be done in the event that it does. When the unthinkable happens, then, Brockton Animal Hospital is ready to have that tough conversation with Boston, MA pet owners who need a guiding hand, then take the steps that you deem best. Our staff is able to provide lymphoma and other cancer treatments for your companion: the exact nature of our service will depend on the specifics of the disease and how you desire to move forward. As an animal owner, you’ll need to be diligent in checking your pet for lumps. If you find one, you’ll want to get in touch with our staff as soon as possible to schedule a check-up and possible surgery. We work primarily with cats and dogs in this kind of situation, but we may be able to help other species, depending on the situation. Don’t be afraid to ask! Benign tumors are masses of cells that do not have the ability to infect nearby tissue and spread, and are therefore not considered cancerous. Many types, however, have the potential to become cancerous if left alone. 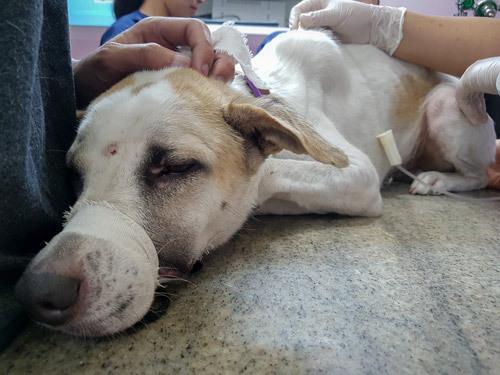 Because they generally have a slow growth rate, however, catching them early and making sure that they are completely removed will mean your pet has a very good chance of being fully cured. Malignant tumors are another matter entirely. These are cancerous and will spread to other parts of the body — sometimes very quickly — if not found and excised right away. If they can be cleanly (fully) removed before they multiply too extensively and aren’t particularly aggressive, the possibility of your pet going into remission is a distinct one, though you will have to remain diligent in checking for signs of a possible relapse. If your pet is suffering from a particularly intrusive form of cancer, and/or cannot have it fully removed, the situation becomes more complicated. You’ll have to decide whether or not additional surgeries are a feasible option, along with complimenting therapies that are often required to fully treat the illness. These can include chemotherapy, radiation, and nutritional treatments. But while some owners may have the means or the desire to do “whatever it takes” to keep their pets alive, others may simply choose to ensure that their friends live as comfortable and meaningful a life as they can for as long as possible: something referred to as palliative care. While this kind of decision can only be made by you, it is important to have a veterinarian who you can trust: one who will not only handle such delicate surgeries with the care and focus that they require, but also give you an honest and straightforward expectation of what your options are and which may be the most pragmatic. 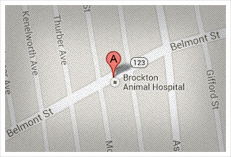 Whatever your choice, Brockton Animal Hospital will be there to help you every step of the way to keep your companion as happy and healthy as possible, whether it’s through surgery, alternative therapy, or some combination of the two. Pet owners in Boston, MA can give us a call the moment they suspect something may be amiss; we’ll be ready to offer you our hand from there.